What you know does matter. And what you know is what your prospects want to know. They just want to learn it from a different perspective – theirs. And you’ll learn how to do that in this free report . When you follow the tips and examples in this complementary guide, you’ll stop churning out “stuff” because you have to and, instead, understand how to create targeted, practical, useful information that helps turn online and offline visitors into prospects and helps turn prospects into customers. 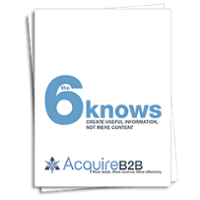 Just complete the form to download The 6 Knows… and, minutes after reading it, you’ll understand how information beats content… from your own perspective.